The United States was the dominant world power in the early 1950s. Lockheed U-2 spy plane flights over the Soviet Union provided intelligence that the U.S. held the advantage in nuclear capability. However, an education gap was identified when studies conducted between 1955 and 1961 reported that the Soviet Union was training two to three times as many scientists per year as the United States. The launch and orbit of Sputnik 1 suggested that the USSR had made a substantial leap forward in technology, which was interpreted as a serious threat to U.S. national security. This spurred the United States to make substantial federal investments in research and development, education and national security. The Juno I rocket that carried the first U.S. satellite Explorer 1 had been ready to launch in 1956, but that fact was classified and unknown to the public. The Army's PGM-19 Jupiter from which Juno was derived had been mothballed on the orders of defense secretary Charles Erwin Wilson amid interservice rivalry with the U.S. Air Force's PGM-17 Thor. The USSR used ICBM technology to launch Sputnik into space. This gave the Soviets two propaganda advantages over the U.S. at once: the capability to send the satellite into orbit, and proof of the distance capabilities of their missiles. This proved that the Soviets had rockets capable of sending nuclear weapons from Russia to Western Europe and even North America. This was the most immediate threat that the launch of Sputnik 1 posed. The United States, a land with a history of geographical security from European wars, suddenly seemed vulnerable. A contributing factor to the Sputnik Crisis was that the Soviets had not released a photograph of the satellite for five days after the launch. Until this point, its appearance remained a mystery to Americans. Another factor was Sputnik's weight of 184 pounds (83 kg), compared to United States' plans to launch a satellite of 21.5 pounds (9.8 kg). The Soviet claim seemed outrageous to many American officials who doubted its accuracy. U.S. rockets at the time produced 150,000 pounds-force (670,000 N) of thrust and U.S. officials presumed that the Soviet rocket that launched Sputnik into space had to have produced 200,000 pounds-force (890,000 N) of thrust. In fact, the R-7 rocket that launched Sputnik 1 into space produced almost 1,000,000 pounds-force (4,400,000 N) of thrust. All these factors contributed to the American people's perception that they were greatly behind the Soviets in the development of space technologies. The successful launch of Sputnik 1 and the subsequent failure of the first two Project Vanguard launch attempts, greatly accentuated the perception in the United States of a threat from the Soviet Union, a perception that had persisted since the Cold War began after World War II. The same rocket that launched Sputnik could send a nuclear warhead anywhere in the world in a matter of minutes, stripping the continental United States of its oceanic defenses. The Soviets had demonstrated this capability on 21 August with a 6,000-kilometer (3,700 mi) test flight of the R-7 booster. The event was announced by TASS five days later and was widely reported in other media. Five days after the launch of Sputnik 1, the world's first artificial satellite, Eisenhower addressed the people of the United States. After being asked by a reporter about security concerns regarding the Russian satellite, Eisenhower said "Now, so far as the satellite itself is concerned, that does not raise my apprehensions, not one iota". Eisenhower made the argument that Sputnik was only a scientific achievement and not a military threat or change in world power. 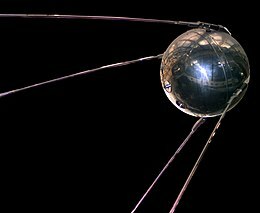 Eisenhower believed that Sputnik's weight "was not commensurate with anything of great military significance, and that was also a factor in putting it in [proper] perspective". The USSR had surpassed the United States and "the rest of the free world" in scientific and technological advancements in outer space. If the USSR maintained this superiority, it might use it as a means to undermine the United States' prestige and leadership. If the USSR became the first to achieve significantly superior military capability in outer space and create an imbalance of power, it could pose a direct military threat to the United States. He followed this statement by saying that the United States needed to meet these challenges with "resourcefulness and vigor". Eisenhower's ability to project confidence about the situation was limited because his confidence was based on clandestine reconnaissance. As such, he failed to quell the fears that there was a shift in power between the Americans and Soviets. The perception of the Soviets as more modern than Americans was reinforced by Eisenhower's old-fashioned style. The launch of Sputnik 1 also impacted Eisenhower's ratings in his polls, from which he eventually recovered. The media stirred a moral panic by writing sensational pieces on the event. In the first and second days following the event, New York Times wrote that the launch of Sputnik 1 was a major global propaganda and prestige triumph for Russian Communism. Not until after the people of the United States were exposed to a multitude of news reports did it become a "nation in shock". The media not only reported public concern, it also created the hysteria. Journalists greatly exaggerated the danger of the Soviet satellite for their own benefit. On October 9, 1957, notable science fiction writer and scientist Arthur C. Clarke said that the day Sputnik orbited around the Earth the United States became a second-rate power. Politicians used the event to bolster their ratings in polls. Research and development was used as a propaganda tool and Congress spent large sums of money on the perceived problem of American technological deficiency. After the launch of Sputnik 1 national security advisers overestimated the USSR's current and potential rocket strength which alarmed portions of Congress and the executive branch. When these estimations were released, Eisenhower was forced into an accelerated missile race to appease those concerned with America's safety. Sputnik provoked Congress into taking action on improving the United States' standing in the fields of science. The Soviets also had a hand in the political exploitation of the event. Nikita Khrushchev, leader of the USSR, reflected on the event saying "It always sounded good to say in public speeches that we could hit a fly at any distance with our missiles. Despite the wide radius of destruction caused by our nuclear warheads, pinpoint accuracy was still necessary - and it was difficult to achieve". At the time, Khrushchev stated that "our potential enemies cringe in fright". Political analyst Samuel Lubell conducted research on public opinion about Sputnik and found "no evidence at all of any panic or hysteria in the public's reaction" confirming that it was an elite, not popular, panic. The launch spurred a series of initiatives by the United States, ranging from defense to education. Increased emphasis was placed on the Navy's Project Vanguard to launch an American satellite into orbit. There was renewed interest in the preceding Explorer program that launched the first American satellite into orbit on January 31, 1958. In February 1958, Eisenhower authorized formation of the Advanced Research Projects Agency, later renamed the Defense Advanced Research Projects Agency (DARPA), within the Department of Defense (DoD) to develop emerging technologies for the U.S. military. On July 29, 1958, he signed the National Aeronautics and Space Act, the creation of NASA. Less than a year after the Sputnik launch, Congress passed the National Defense Education Act (NDEA). The act was a four-year program that poured billions of dollars into the U.S. education system. In 1953 the government spent $153 million, and colleges took $10 million of that funding; however, by 1960 the combined funding grew almost six-fold because of the NDEA. After the initial public shock, the Space Race began, leading to the first human launched into space, Project Apollo and the first humans to land on the Moon in 1969. Campaigning in 1960 on closing the "missile gap", Eisenhower's successor John F. Kennedy decided to deploy 1,000 Minuteman missiles. This was many more ICBMs than the Soviets had at the time. Though Kennedy did not favor a massive U.S. manned space program while in the U.S. Senate during Eisenhower's term, public reaction to the Soviet's launching the first human into orbit, Yuri Gagarin, on April 12, 1961 led Kennedy to raise the stakes of the Space Race by setting the goal of landing men on the Moon. Kennedy claimed that "If the Soviets control space they can control the earth, as in past centuries the nation that controlled the seas dominated the continents". Eisenhower disagreed with Kennedy's goal, referring to it as a "stunt". Kennedy had privately acknowledged that the space race was a waste of money, but he knew there were benefits from a frightened electorate. The space race was less about its intrinsic importance and more about prestige and calming the public. The Sputnik Crisis sparked the U.S. drive to retake the lead in space exploration from the Soviets, and fueled its drive to land men on the Moon. American officials had a variety of opinions at the time, some registering alarm, others dismissing the satellite. Gerald Ford, a Republican congressman from Michigan, had stated that "We Middle Westerners are sometimes called isolationists. I don't agree with the label; but there can be no isolationists anywhere when a thermonuclear warhead can flash down from space at hypersonic speed to reach any spot on Earth minutes after its launching". Former United States Rear Admiral Rawson Bennett, chief of naval operations, stated that Sputnik was a "hunk of iron almost anybody could launch". The Sputnik Crisis also spurred substantial transformation in the United States' science policy which provided much of the basis for modern academic scientific research. In the mid-1960s NASA went on to provide almost 10 percent of the federal funds for academic research. Further expansion was made in the funding and research of space weapons and missile defense in the form of anti-ballistic missile proposals. Education programs were initiated to foster a new generation of engineers and support was dramatically increased for scientific research. Congress increased the National Science Foundation (NSF) appropriation for 1959 to $134 million, almost $100 million higher than the year before. By 1968, the NSF budget stood at nearly $500 million. According to Marie Thorsten, Americans experienced a "techno-other void" after the Sputnik crisis and continue to express longing for "another Sputnik" to boost education and innovation. During the 1980s, the rise of Japan filled that void temporarily. Following the Sputnik crisis, leaders exploited an "awe doctrine" to organize learning "around a single model of educational national security: with math and science serving for supremacy in science and engineering, foreign languages and cultures for potential espionage, and history and humanities for national self-definition". American leaders were not able to exploit the image of Japan as effectively, despite its representations of super-smart students and a strong economy. In Britain the launch of the first Sputnik provoked surprise, combined with elation at experiencing the dawn of the Space Age. It also aroused feelings of sadness, for it reminded the public of their nation's loss of prestige and power on the world stage. The crisis soon became part of the broader Cold War narrative. Much of the public nervousness that did exist was dispelled when the Soviets launched Laika (one of several space dogs sent into space during the 1950s and 1960s) into space in November 1957 aboard Sputnik 2, which was seen less as a threat and more so as a propaganda maneuver to cause turmoil. ^ a b "Some History of the Department of Astronomy". University of Illinois at Urbana-Champaign. Archived from the original on 4 May 2007. ^ a b Kay, Sean (April–May 2013). "America's Sputnik Moments". Survival. doi:10.1080/00396338.2013.784470. ^ Bradley Lightbody (1999). The Cold War. Psychology Press. p. 55. ISBN 978-0-415-19526-3. ^ Kaiser, David (2006). "The Physics of Spin: Sputnik Politics and American Physicists in the 1950s". Social Research. ^ a b Macdougall, Ian (August 15, 2016). "The Leak Prosecution That Lost the Space Race". The Atlantic. ^ a b c d e f g h i j k l m Mieczkowski, Yanek (2013). Eisenhower's Sputnik Moment: The Race for Space and World Prestige. United States of America: Cornell University Press. p. 11. ISBN 978-0-8014-5150-8. ^ King, I. R.; McVittie, G. C.; Swenson, G. W.; Wyatt, S. P. (9 November 1957). "Further observations of the first satellite". Nature (4593): 943. Bibcode:1957Natur.180..943K. doi:10.1038/180943a0. ^ Isachenkov, Vladimir (1 October 2007). "Secrets of Sputnik Launch Revealed". USA Today. Associated Press. Archived from the original on 13 February 2014. Retrieved 13 February 2014. ^ a b c d e f Peoples, Columba (2008). "Sputnik and 'Skill Thinking' Revisited: Technological Determinism in American Responses to the Soviet Missile Threat". Cold War History. ^ a b c d e DeGroot, Gerard (December 2007). "Sputnik 1957". American History. ^ a b c d e f g h McQuaid, Kim (2007). "Sputnik Reconsidered: Image and Reality in the Early Space Age". Canadian Review of American Studies. ^ a b History Channel (2012a). ^ Schefter (1999), pp. 25–26. ^ Layman & Tompkins (1994), p. 190. ^ Dickson (2003), pp. 5–6, 160—162. ^ Dickson (2003), pp. 213–214. ^ a b Geiger, Roger (1997). "What Happened After Sputnik? Shaping University Research in the United States". Minerva: A Review of Science, Learning and Policy. ^ Thorsten (2012), p. 74. ^ Barnett, Nicholas (May 2013). "Russia Wins Space Race: The British Press and the Sputnik Moment, 1957". Media History. 19 (2): 182–195. doi:10.1080/13688804.2013.791419. Bruccoli, Matthew J.; Bondi, Victor; Baughman, Judith (1994). Layman, Richard; Tompkins, Vincent, eds. American Decades: 1950—1959. Vol. 6. Detroit: Gale Research. ISBN 0-810-35727-5. DeNooyer, Rushmore (2007-11-06). "Sputnik Declassified". NOVA (Transcript). PBS. Archived from the original on 2012-09-13. "July 29: NASA Created". This Day in History. New York: History Channel. 2012. Archived from the original on 2012-09-13. 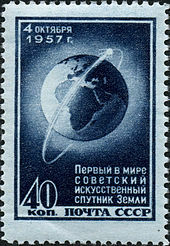 "October 4: Sputnik launched". This Day in History. New York: History Channel. 2012. Archived from the original on 2012-09-13. Launius, Roger D. (2005). "Sputnik and the Origins of the Space Age". Sputnik and The Dawn of the Space Age. Washington, D.C.: NASA. Archived from the original on 2012-09-13.